The company Saatchi & Saatchi Russia develops advertising concepts and is a part of the global network Saatchi & Saatchi Worldwide. Saatchi & Saatchi is a creative advertising agency that designs and launches new unconventional ideas and solutions. The company decided to change the existing office due to the new office space requirements. The chief goal of the customer was to create office with a striking design that reflects their main activity, to make office functional in terms of the layout decisions and the technical equipment of the work places. At the same time, the office must pleasantly surprise the clients, comply with their expectations, inspire the employees and create the conditions for effective work. Such motivating office promotes a creative atmosphere and exchange of experience which is the key to the business success for this company. 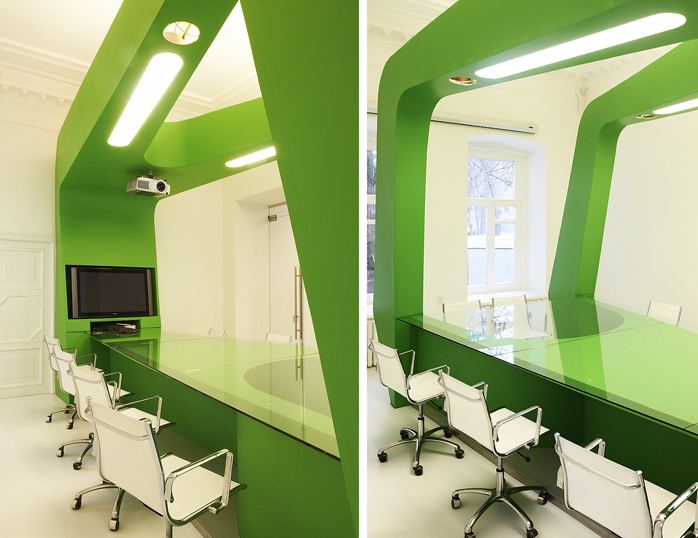 The concept of the future office has been developed by the architectural bureau. 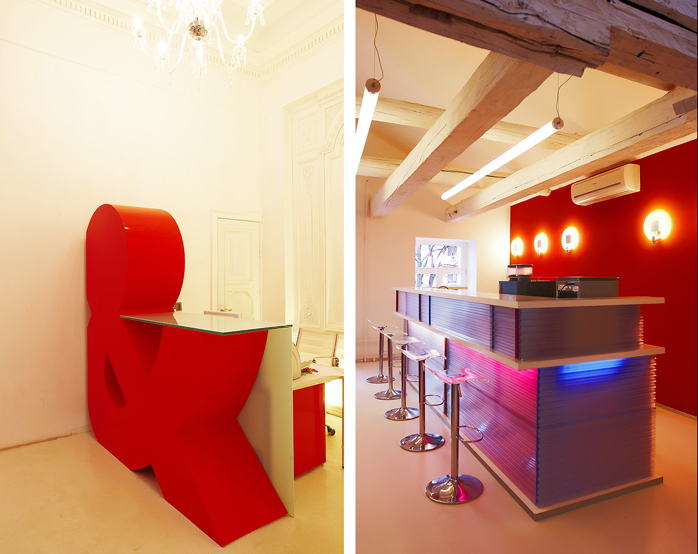 Our company was to realize their concepts and supply the furniture solutions. The project consists of several custom-made objects, the work furniture, wall panels made of lexan (plycarbonate cell), a new material commonly used in industries. After we received this task, we adapted all custom-made constructions to the existing office space making them more functional according to the requirements of the client and the specific character of their work. The office is divided into the following areas: the reception, the large conference room, the open space, the offices for the managers and recreation area. 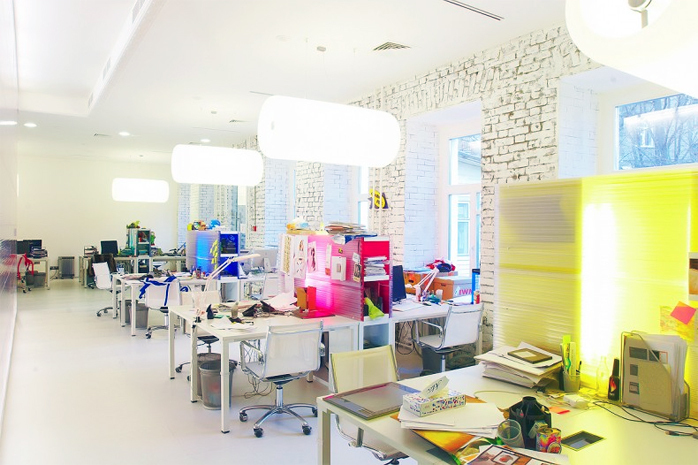 Saatchi & Saatchi is an advertising and very creative agency where the work is done in a team that is why they chose the open space area as the main part of the office. But there is a division according to the statuses; also there are a few separate offices which are however done in a very democratic style (the furniture is exactly the same as in the open space, and the glass partitions are used for the visual space consolidation). As meetings with the clients are often held in a large team, we provided a spacious conference room realized in an unusual style. A special space is given to the bar which is combined with the recreational area with sofas, bookshelves, a board game, and a projector. Here all stuff meets during the day and in the evenings. A lot of issues and ideas are realized and solved in a relaxed, almost home-like friendly atmosphere, that is why this area in particular is very important. The primary emphasis is given to the custom-made constructions that carry the main conceptual significance. The light hues of gray and white chosen for the furniture complement and emphasize the original colors and the unconventional shapes of the custom-made products.